Within a few months of assuming the position of curator of medieval coins at the American Numismatic Society in 1980, Alan M. Stahl was presented with a plastic bag containing a hoard of 5,000 recently discovered coins, most of which turned out to be from medieval Venice. The course of study of that hoard (and a later one containing more than 14,000 coins) led him to the Venetian archives, where he examined thousands of unpublished manuscripts. 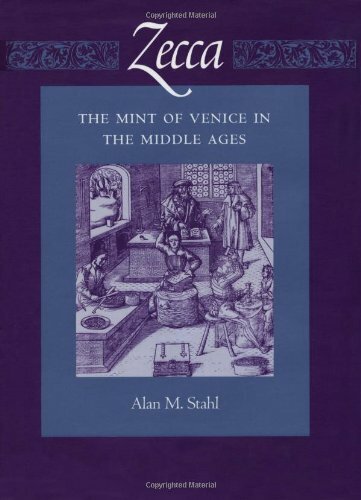 To provide an even more accurate account of how the Zecca mint operated in Venice in the thirteenth through fifteenth centuries, Stahl commissioned scientific analyses of the coins using a variety of modern techniques, uncovering information about their content and how they had been manufactured. The resulting book, Zecca: The Mint of Venice in the Middle Ages, is the first to examine the workings of a premodern mint using extensive research in original documents as well as detailed study of the coins themselves. The first of the book's three sections traces the coinage of Venice from its origins in the ninth century as a minor, and unofficial, regional Italian coinage to its position at the dawn of the Renaissance as the dominant currency of Mediterranean trade. The second section, entitled "The Mint in the Life of Medieval Venice," illustrates the mechanisms of the control of bullion and the strategies for mint profit and explores the mint's role in Venetian trade and the emergence of a bureaucratized government. The third section, "Within the Mint," examines the physical operations that transformed raw bullion into coins and identifies the personnel of the mint, situating the holders of each position in the context of their social and professional backgrounds. Illustrated with photos of Venetian coinage from the world's major collections, Zecca also includes a listing of all holders of offices related to the medieval Venetian mint and summaries of all major finds of medieval Venetian coins. View More In Money & Monetary Policy. If you have any questions about this product by Brand: Johns Hopkins University Press, contact us by completing and submitting the form below. If you are looking for a specif part number, please include it with your message.